Televue 13mm Ethos Eyepiece - 1.25"/2"
The TeleVue 13mm Ethos Eyepiece employs flat finished baffles and specialty coatings that are tuned to the composition of each element for maximum contrast. The TeleVue 13mm Ethos Eyepiece is available in 2”/1¼” barrel size and yields an incredible 15mm of eye relief. 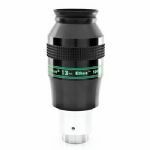 This 13mm focal length eyepiece has an effective field stop of 22.4mm and accepts DIOPTRX™ eyesight astigmatism corrector. The TeleVue 13mm Ethos Eyepiece gives dramatic mid-magnification views combined with stunning wide field backgrounds suitable for use with binocular viewers. At the 2007 Northeast Astronomy Forum in New York, Tele Vue introduced attendees to a new observing experience with personal views through the new Ethos. With a 13mm focal length evoking the original “Nagler” revolution, the field area of this new eyepiece is, at 100º, more than 50% larger than an 82º field. The Televue 13mm Ethos eyepiece is essentially multiple eyepieces, delivering the true field size of a longer focal length, narrower apparent field eyepiece with the benefits of higher power and darker sky background. Televue is known for its in-house eyepiece and telescope designs by Al Nagler. Televue's latest eyepiece brings new meaning to the term “in-house.” The concept for the 13mm Ethos eyepiece was first proposed by Televue President David Nagler, with performance parameters giving it the fundamental characteristics (the ethos) of a Tele Vue eyepiece: high contrast, comfortable eye relief and full field sharpness. Control of astigmatism, field curvature, lateral color, angular magnification distortion correction (technical reference), and low pupil sensitivity for daytime use were specified criteria. Following Tele Vue’s philosophy of pushing the state of the art, long-time Televue employee and optical design protégé Paul Dellechiaie took up the challenge and designed the basic eyepiece form. Under Al’s guidance, Paul tweaked his design to fulfill the original goals. The Televue 13mm Ethos eyepiece has now been shown at NEAF, TSP, RTMC, as well as other major astronomy events. The Televue Ethos has been extremely well received by the astronomy community and will be one of the most highly anticipated products to be released in years. Majesty Factor Visualization: 13-mm Ethos (left) and 26-mm Plössl (right) have same true field of the Double Cluster. But Ethos has twice the power factor and four times the contrast factor. Ethos therefore has a Majesty Factor of eight relative to the Plössl's Majesty Factor of one. For reference, the 0.9° true field shown could be produced by a 14" f/4 telescope using the 100° Ethos at 109x with a 3.2mm exit pupil or the 26-mm 50° Plössl at 55x with a 6.5mm exit pupil. The Ethos has now been shown at NEAF, TSP, RTMC, and EPOCH 2007. We thought you’d enjoy sharing in the experience by reading some of the comments written in our “comment” notebook. The following display was created for daytime observation using the Ethos in an NP127is at NEAF and TSP, and an NP101 at RTMC. The left chart has circles representing field diameters of 50°, 60°, 68°, 82° and 100° with the telescope distance set so that the 100° circle matched the view of the Ethos field-stop. The “crosshairs” are actually small Saturn drawings in 5° increments to illustrate the linear angular-magnification correction. Illustrations of Saturn were placed at the center and edge of the field so contrast and detail (including newsprint dot patterns) could be evaluated. The chart to the right is an artificial very-rich “star field” made (and conceived) by Rick Scheck in our scope production dept. The bright “star” reflections made a more realistic contrast simulation than simply viewing astronomical pictures and helped to give a “night sky” impression that nicely represented a dense Milky Way star field. Real night-sky viewing was done two nights at the dark Prude Ranch location of the Texas Star Party using telescopes ranging from our NP127is to the prize winning 12” f/5.5 Newtonian of our own Scott Ewart. Ethos also made its way into various large Dobsonians including those of Barbara Wilson and Larry Mitchell. At the Riverside Telescope Makers Convention in California, we had two clear, though very bright moonlit nights for evaluation. Using an NP101 and NP127is Ethos treated us to clusters such as M44 and M24. At EPOCH 2007 in western Indiana, we were pleased to have one very clear evening to demonstrate Ethos with our NP127is and Chris Brownewell's 25" Obsession. Good Luck, Chris, on this new star party venture, and a big Thanx for being a great host. On a personal note, I was especially moved by just showing a random star field to a little 10-year-old girl in a group visiting RTMC from Anaheim. Her only words: “Oh my gosh, it’s beautiful.” It doesn’t get any better than that. 1. Always center an object for the best view. 2. The field edge is only good for framing the object. 3. Eyepieces >70 deg FoV are mega-ultra-hyper-uber wide angle. Accept that compromise in edge quality.